As Mary Poppins once said; 'practically perfect in every way'. It's an absolutely beautiful book, both inside and out. When I first received it, I spent a good hour leafing through its pages, utterly enchanted by its pretty pink swirly whirly style. Beautiful. It was my intention to find a recipe to make, but I just ended up looking at all the pictures! Its title page reads 'Baking Storybook'. That's exactly what it reminds me of. When I was a little girl I has a book full of nursery rhymes about old folk who lived in shoes, and chap who had birds living in his beard. I loved it. I'm whisked away to the land of the magic faraway tree, and I am Milly-Molly-Mandy. Only now I'm pushing 30 and baking cakes, not sat on the carpet with my legs crossed. This is an american book so all the recipes are in cups, which would normally put me off. However, I was willing to make a special exception. Before looking at the book in detail, I had that longing feeling that it would have some of the old american bake-off staples in there. Sure enough, Lisa Yockelson does not disappoint me! There were plenty to choose from. I settled on her Apple Cake with Maple Butter Glaze. She recommends to use a nine inch tube pan for this recipe, but I threw caution to the wind and popped it in a star shaped bundt tin instead. As you do. This is one beautiful cake. It's a lumpy mix, so you don't get the perfectly crisp edges like you do from something like my Matilda cake, but it really doesn't matter a bit. The maple butter glaze adds a certain oomph to an already outstanding cake. I cannot wait to make more recipes from this book. I almost don't want to tell you too much more, because I don't want to ruin the surprises within... I feel like I'm spoiling the ending of a brilliant story. Disclaimer: I reviewed this book because it was pink and full of beautiful things. It was sent to me by the publisher, but I did not receive any payment for the review. 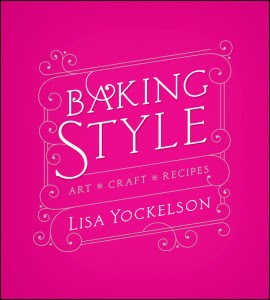 Read more about the author at http://bakingstylediary.com. Enjoy BAKING BY FLAVOR--especially the recipe titled Essence of Chocolate Sqaures (page 282).